Sylvie Courvoisier, originally from Lausanne, moved to Brooklyn in 1998 and is now as completely at home in America as she is in Europe. 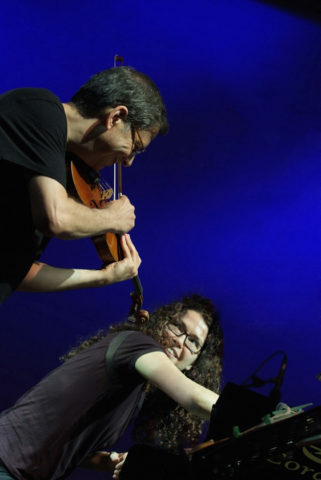 Her music-making and her composition reflect neoclassical influences, and she also combines the European improv tradition with the no-holds-barred approach of the New York downtown scene based around John Zorn. Mark Feldman is a musician whose multi-faceted nature is not dissimilar to Courvoisier’s. He is a composer and improviser whose outlook on the world can come from a whole variety of different perspectives. Seit ihrem Umzug nach Brooklyn, New York, im Jahr 1998 ist die Lausanner Musikerin Sylvie Courvoisier in beiden Welten zu Hause: in der europäischen und in der amerikanischen. In ihrem Spiel und in ihren Kompositionen reflektiert sie neoklassische Einflüsse ebenso wie die europäische Improvisationsmusik und den experimentellen Nonkonformismus der New Yorker Downtown-Szene um John Zorn. Mark Feldman ist ein Musiker von ähnlicher Vielseitigkeit, ein Komponist und Improvisator mit einer multiperspektivischen Sicht auf die Welt. The percussionist as a poet; the drummer in the role of a painter of soundscapes; the composer who has a convincing story to tell. Pierre Favre’s first percussion ensemble was called Singing Drums, a band-name which sets out its stall clearly: the search for a ‘voice’ for drums. Hardly any other drummers have made drumming and percussion ensembles such a permanent part of their musical activity as Pierre Favre. It was in this context that he has extended the sound palette of the drum kit – listen out for everything from rudimentals deployed in a virtuoso way to wonderfully woven and wafted textures. Der Perkussionist als Poet, der Schlagzeuger als Klangmaler, der Komponist als Geschichtenerzähler. «Singing Drums» hiess Pierre Favres erstes Schlagzeugensemble. Ein programmatischer Titel: Die Suche nach der «Stimme» in der Trommel hat Pierre Favre nicht mehr losgelassen. Kaum ein anderer Drummer hat so konstant mit Perkussionsensembles gearbeitet wie Pierre Favre. Mit ihnen erweiterte er die Klangpalette des Schlagzeugs – von den virtuosen Rudimentals bis zu wunderbar verspielten und versponnenen Klanggeweben. 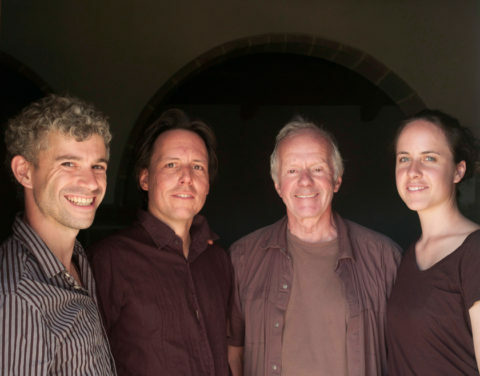 Während fünf Jahren feilte Pierre Favre mit Chris Jaeger, Valeria Zangger und Markus Lauterburg, drei der spannendsten Schweizer SchlagzeugerInnen der jüngeren Generation, am Repertoire für das Album «Pierre Favre DrumSights, Now». Obschon die meisten Stücke ausgeschriebene Kompositionen sind, spielen sie alles auswendig. «Und die komplexesten und riskantesten Teile spielen wir mit einem Lächeln», ergänzt Pierre Favre. The Intakt-Records-Festival at the Vortex Jazz Club in London is over. Thanks so much to the Vortex-Team for the great hospitality and support!